Canterbury District Green Party: EKAF VISIT DOWNING STREET TODAY. EKAF VISIT DOWNING STREET TODAY. Members of East Kent Against Fracking went to 10, Downing Street today to deliver a letter to the Prime Minister. The letter sets out clearly the grave concerns about the 'dash for gas' in East Kent. EKAF Secretary Pat Marsh outside No 10. 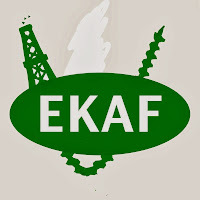 Join EKAF today.